Fortune Girl slot has a slight clue in the name as to its theme as 'fortune' is taken very seriously in the Far East and if you were following that train of thought you are 100% correct. We have an Oriental theme with a starring character who looks suspiciously like Netent's Koi Princess on purple reels set against a backdrop of a treasure store and you can guess the type of background music and sounds we get. The main question is, will Fortune Girl live up to here name? A standard 5 reels of 3 rows and 15 pay lines is what Fortune Girl gives us so with this lower amount of pay lines, are the reels wins good? The game's logo forms a stacked Wild on all reels and pays 23x bet for a 5-of-a-kind win, followed by Fortune Girl herself at 15x, coin chest at 13x, charms at 10x, silver cups at 8x and finally an old abacus pays 5x for the 5. There are card values too but these appear in their equivalent Chinese characters and pay between 1 and 3 x bet. There are stacked mystery symbols in the form of gold tokens on all reels. When the spin has finished any in view will all reveal the same character which can be anything including the game's scatter. That would be good as you need 3 to win the bonus and if you get 15 of them via the full screen of mystery symbols then you are granted a fortune - 1200x stake! So having landed 3 scatters via the singles that appear on all reels or the stacked mystery symbols or even a combination of both, you are awarded 14 free spins. There are no initial enhancements but 3 or more scatters appearing in them increase the win multiplier 1x, and you can achieve a maximum of 5x. 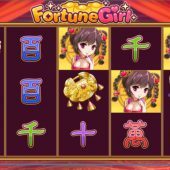 Fortune Girl slot isn't a bad game in that it works, there is big pay potential and the in-play mystery is interesting. Unfortunately, despite over 96% RTP, that is where the positives end. The repeated noise of the mystery gold tokens revealing after nearly every spin (even when they don't need to as no win can be possible) is rapidly irksome to the player. To cap it all off we have yet another Microgaming 'clone' slot, being the same game as Secret Romance. However, it was a long time ago that this fact was a surprise.